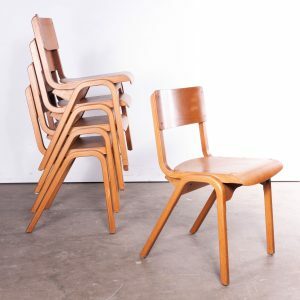 Set of eight 1960’s Dare Inglis vintage/retro stacking dining chairs In Teak. Dare Inglis was on of the numerous English chair producers that emerged in the post war period. 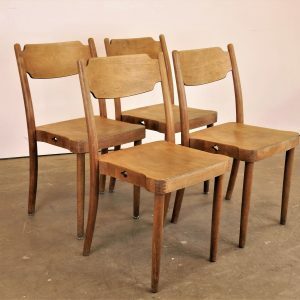 These chairs are particularly smart, dating from the 1960’s with formed Teak seats and tapered tubular legs. 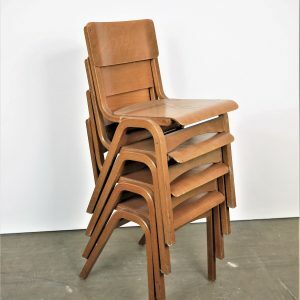 We have a number of these chairs available and are selling them in any multiple required, sets of four, six, eight or simply in singles (�70). We service and wax each chair individually before they leave our workshop and we deliver chairs of excellent quality. If you do require photographs of the exact chairs that you will receive please let us know and we will arrange photographs. 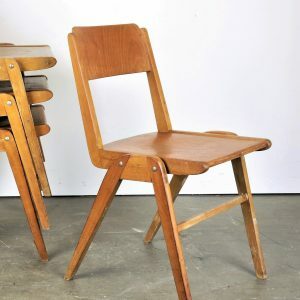 We specialise in high quality vintage dining chairs and have a large range. We only sell the very best chairs in great condition with rich colour and patina, please see the other dining chairs we have listed and please contact us for more details or advice. Seat Height 44cm.